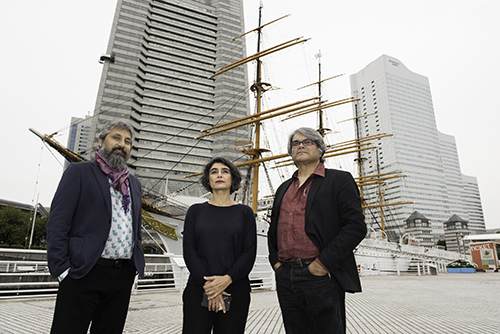 Raqs Media Collective has been appointed as the artistic director for Yokohama Triennale 2020. Raqs Media Collective was formed in 1992 by Jeebesh Bagchi, Monica Narula and Shuddhabrata Sengupta. The word ‘raqs’ in several languages denotes an intensification of awareness and presence attained by whirling, turning, being in a state of revolution. Raqs Media Collective takes this sense of ‘kinetic contemplation’ so as to make a restless and energetic entanglement with the world, and with time. Raqs practices across several forms and media; it makes art, produces performances, writes, curates exhibitions, and occupies a unique position at the intersection of contemporary art, philosophical speculation, and historical enquiry. The members of Raqs Media Collective live and work in New Delhi, India. In 2001, they co-founded the Sarai program at CSDS (Centre for the Study of Developing Societies) New Delhi and ran it for a decade, where they also edited the Sarai Reader series.